The new exercise area is constructed under a colorful canvas shade structure adjacent to the Memorial Community Center. Visitors will enjoy nine new exercise stations including a leg press, chest press, sit-up bench, cross country ski, upper body and more. The new exercise area also features wheelchair accessible exercise equipment. This new exercise area was made possible through a partnership with America on Track. America on Track provides programs that focus on leadership development, mentoring, fitness & nutrition, drug use prevention, and academic achievement for children and families in the community. The event is open to the public. 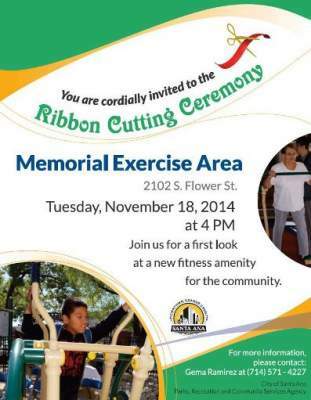 Join us for a first look at the new exercise area. 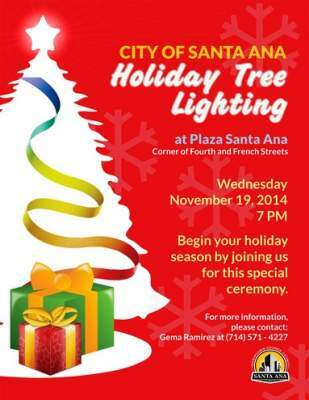 SANTA ANA, CA (November 10, 2014) – Join the City of Santa Ana as we kick off the holiday season with our inaugural Holiday Tree Lighting Ceremony on Wednesday, November 19, 2014 at 7 pm on the corner of Fourth and French Streets. The city will install a 30-ft tree in the downtown area as well as holiday lights throughout the downtown for the enjoyment of all residents and visitors during this holiday season. The tree will be lit nightly for residents and visitors to enjoy. Bring your camera and capture your holiday family photo by the tree. The event is free and open to the public. Light refreshments will be served. Bring the family and create new memories at this festive holiday celebration in the heart of Downtown Santa Ana. 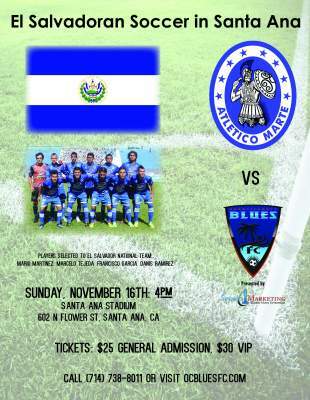 SANTA ANA, CA (November 12, 2014) – The City of Santa Ana is hosting the Orange County Blues FC soccer team in an international friendly match against El Salvador Primera Division side Club Deportivo Atlético Marte on Sunday, November 16th at 4pm at Santa Ana Stadium. This will be the first International match for the recently rebranded OC Blues FC and their first ever game at Santa Ana Stadium. Located in the heart of Orange County, the City of Santa Ana has a population of 330,000 and ranks as the fourth densest city in the nation. With access to four major freeways and a regional transit station, which services Amtrak and Metrolink, Santa Ana is a convenient place to live and work. Santa Ana is home to local, state and federal government offices including the District Attorney’s Office, Orange County Courts and the Ronald Reagan Federal Courthouse. The City is also home to major institutions and corporations including the Bowers Museum, Discovery Science Cube, the Santa Ana Zoo, Yokohama Tires, Crevier BMW (the #1 dealer in the Western United States for the past 25 years), First American Title Corporation, Behr paint, Ingram Micro and the Orange County Register. With its historic architecture, charming streets, live/work lofts, and vibrant restaurant scene, Downtown Santa Ana continues to be regarded by major news publications as one of Orange County’s best neighborhoods.